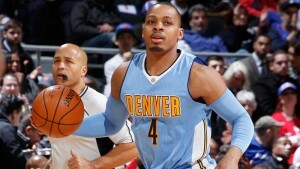 The Oklahoma City Thunder acquired Randy Foye from the Denver Nuggets on the trade deadline. 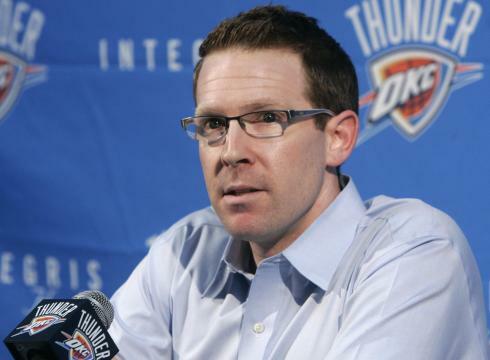 The Thunder gave up DJ Augustin, Steve Novak, and both of their 2016 2nd round picks (theirs and Charlotte’s, which was acquired in the Jeremy Lamb trade this past offseason). 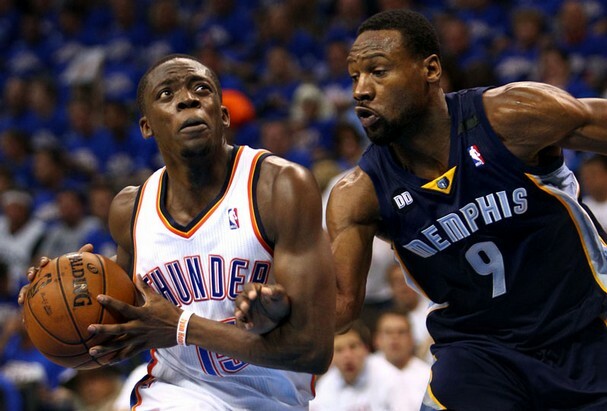 In Foye, the Thunder get a combo guard who is a good (not great) defender and someone who can knock down open shots. 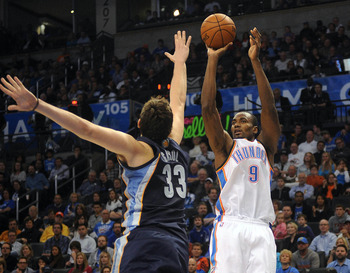 This season, Foye is averaging 6 points and 2.1 assists in nearly 20 minutes of action per game. He is shooting only 29.6% from deep, but has shot 37% from that distance over his career. He shoots much better when he is wide open. 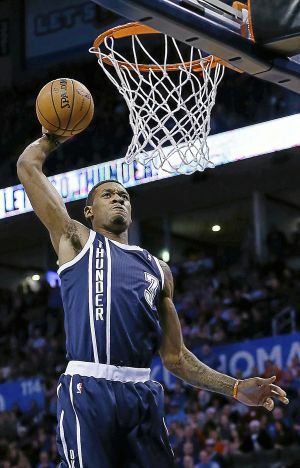 He rarely got that opportunity in Denver, but will get a lot more looks in Oklahoma City with attention grabbers like Kevin Durant and Russell Westbrook on the floor. 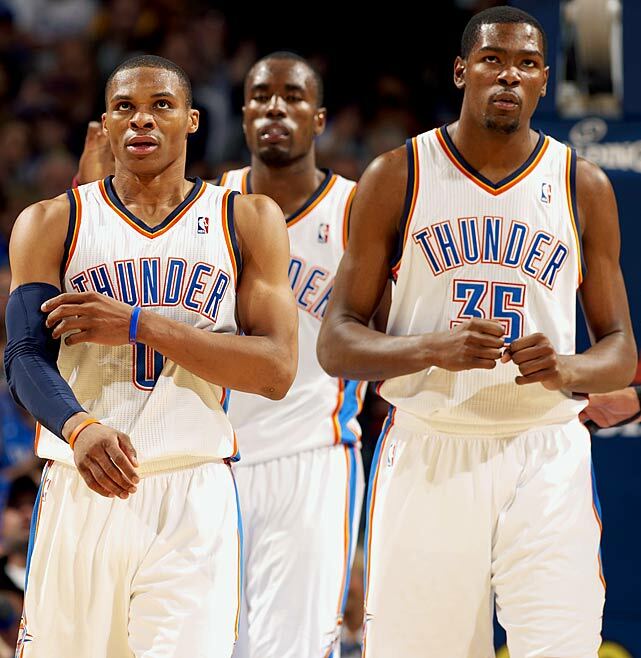 The Thunder’s M.O. 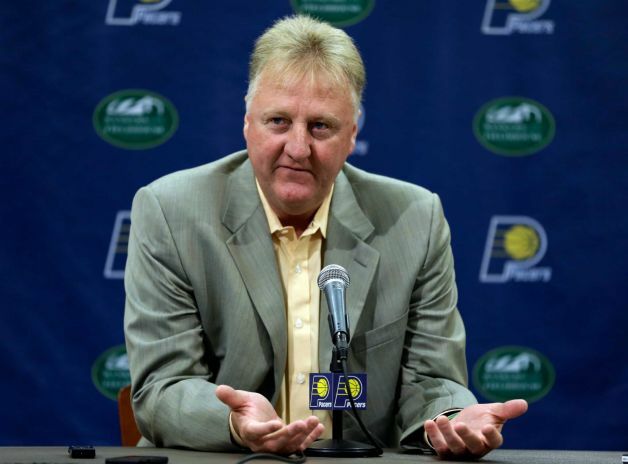 is usually to have three point guards on the roster. Foye is a good enough ball-handler to be a 3rd string point guard, while also being a good enough shooter to be a spacer off the bench. 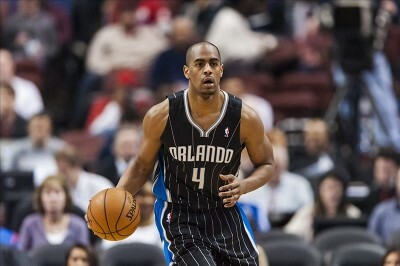 He will help the bench unit defensively and will add another ball-handler to that line-up. But his biggest value may be as a go-between for Cameron Payne as he gains experience in this, his rookie season. Payne has performed well this season, but when the lights were brightest (the Warriors game) he looked wide-eyed and shaky. Which is exactly what you’d expect from a rookie. 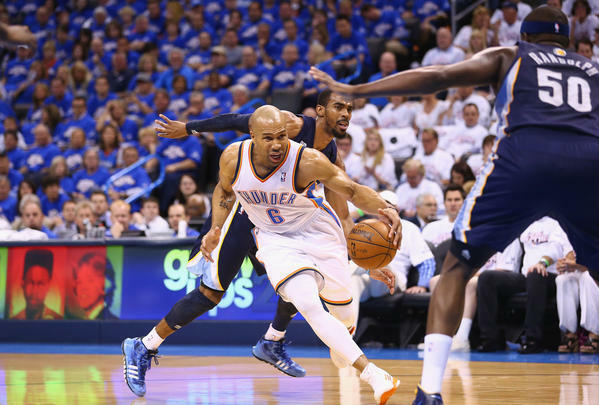 The Thunder trust Payne, but if the stage gets too big for him come April, Foye is the perfect back-up plan to bridge the gap between this season and next season. 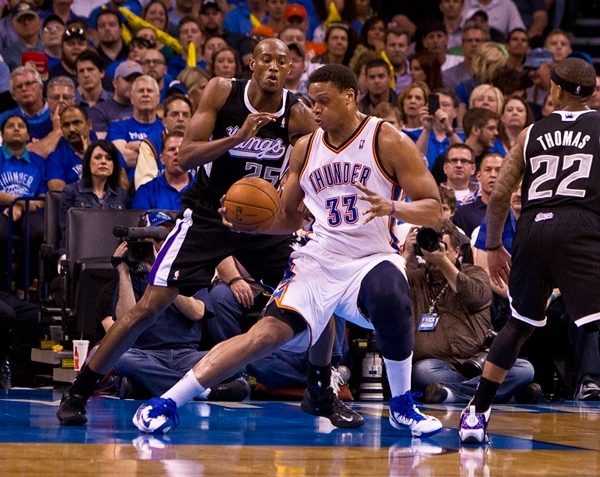 Many people will pan this trade, but I thought it was a good play by the Thunder. Augustin and Novak were out of the rotation and on expiring deals. Instead of just sitting on that, the Thunder decided to get a player that could possibly have an impact in the near future who was also on an expiring deal. 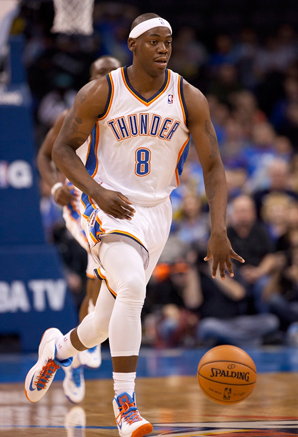 In addition, the move generated a $3.75 million dollar traded player exception (TPE) and opened up a valuable roster spot for the Thunder. That roster spot could be used on a buyout candidate later in the season. 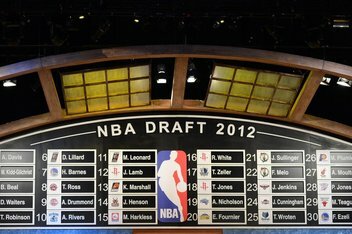 Names that have been thrown out as buy-0ut candidates are Kevin Martin, Joe Johnson, Lance Stephenson, and Andrea Bargnani. Players that won’t necessarily take over a starting spot, but could play a role for a playoff team. 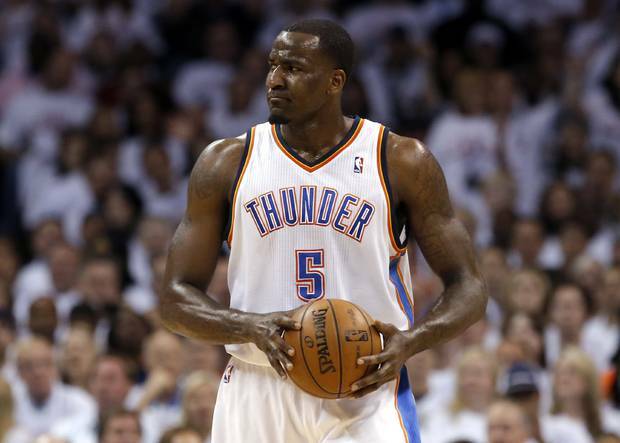 In addition to the roster spot, the move also shaves off over $8 million dollars from the Thunder luxury tax bill. There was never going to be a move that brought the Thunder above the tax line. But any move that could lessen the blow a bit was always welcomed. 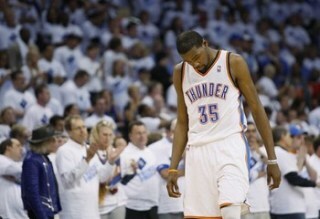 In the end, the Thunder felt they were good enough to stand where they currently were. 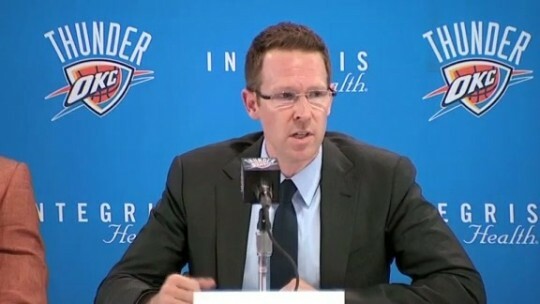 The addition of Foye could prove to be the type of move that helps them against a Golden State in the postseason or it could just be a lateral move where the Thunder traded away two end of the bench players for another end of the bench player. Either way, what the Thunder received outside of Foye (the roster spot, the TPE, the smaller tax bill) could have bigger ramifications for the Thunder moving forward. 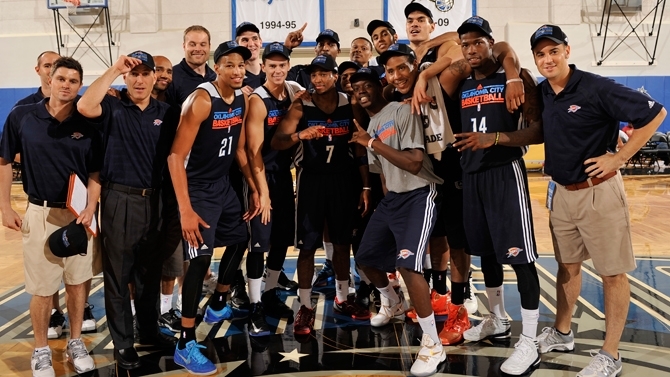 Last season I wrote about the Oklahoma City Thunder’s extensive use of their D-League affiliate, the Tulsa 66ers. After the Harden trade, the Thunder found themselves in the peculiar position of being a contending team, while also having a handful of players that they needed to develop. 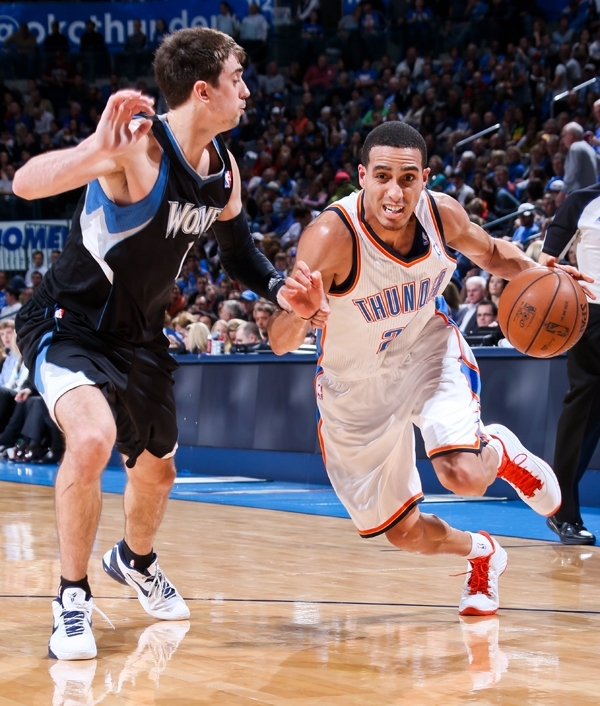 In the Harden trade, they received a good stopgap in Kevin Martin and an apt apprentice in Jeremy Lamb. 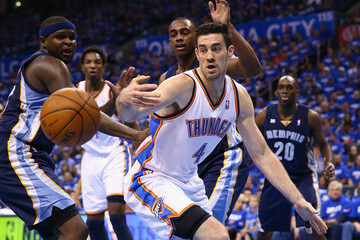 The Thunder used Martin as their 6th man off the bench, and he performed serviceably for them, notching averages of 14.0 ppg and 2.3 rpg on 43% 3pt shooting. 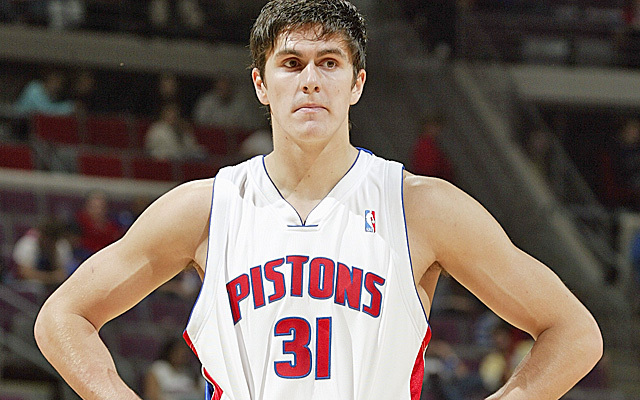 The wild card in the trade was Lamb, the rookie out of Connecticut who was the 12th pick in the 2012 NBA draft. 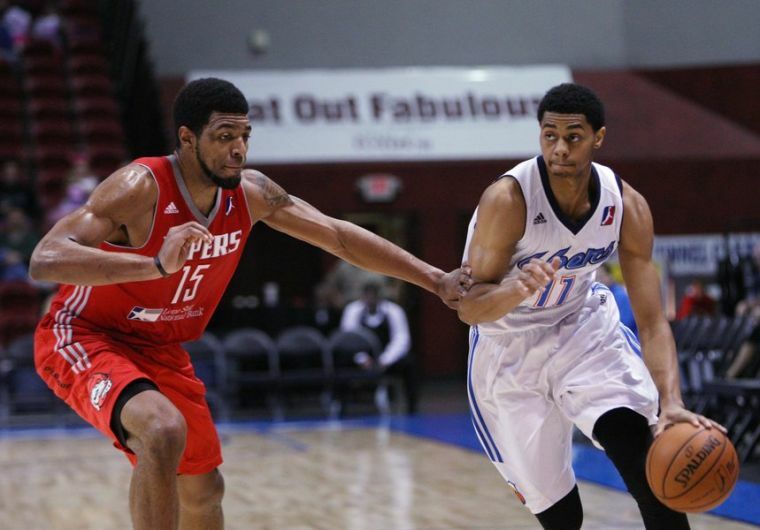 Lamb was used in spot duty throughout the season, but spent most of his time in Tulsa where he averaged 21 points, 5.3 rebounds, 3 assists, and 1.2 steals per game in 21 games. There is no doubt that that experience helped Lamb in his transition to be a major cog off the bench for the Thunder this season. 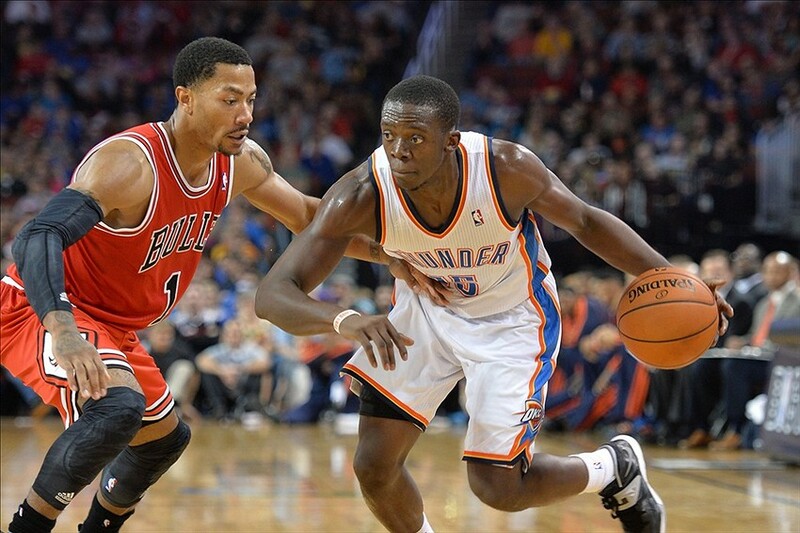 Reggie Jackson spent only 3 games in the D-League last season, but he made his mark known. His per game averages for those 3 games were an astounding 28 points, 7.3 rebounds, and 8.3 assists on 60% FG shooting and 36% 3-pt FG shooting. 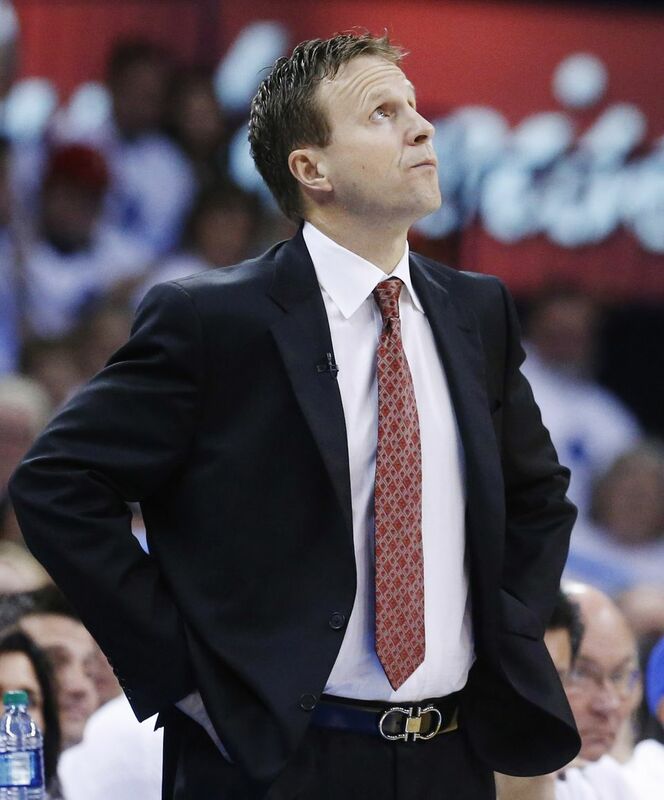 After that 3 game stint, Jackson went on to get the majority of the back-up point guard minutes on the team and eventually led to Eric Maynor being traded to the Portland Trailblazers. 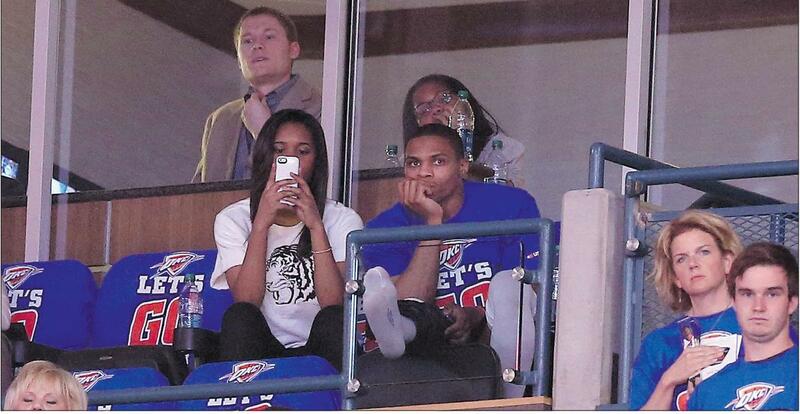 That move paid dividends when Russell Westbrook went down in the second game of the 2013 NBA playoffs. 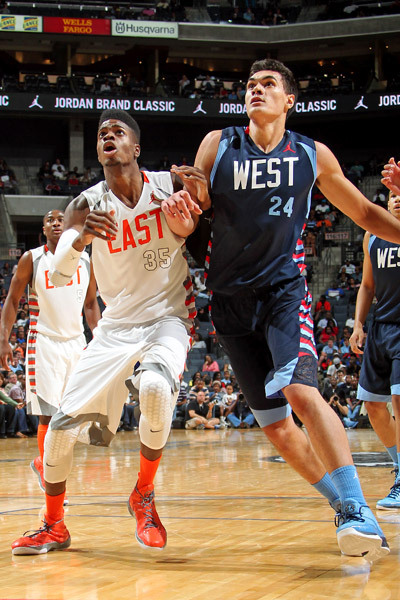 Jackson performed well in his first foray as an NBA starter. 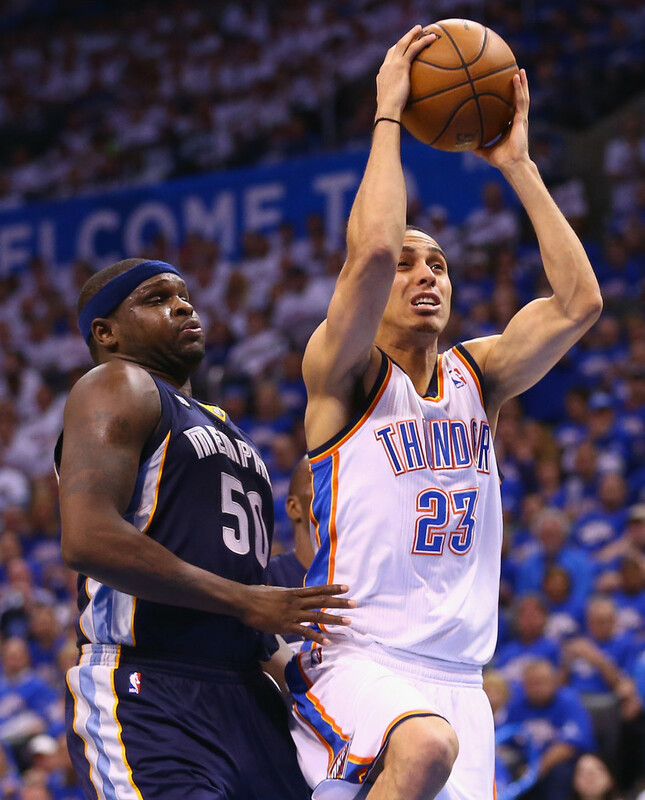 Even though the Thunder lost in the 2nd round of the playoffs, Jackson provided enough of a steady hand that the Thunder knew, regardless of how the Kevin Martin negotiations went in the offseason, that they had a true 6th man already under contract. 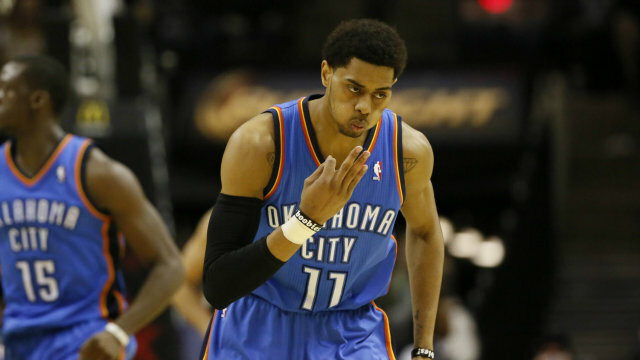 While Jeremy Lamb was an unknown heading into the season, it was known that he would be part of the rotation. 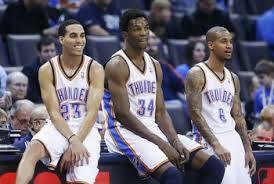 What wasn’t known was how Perry Jones III would fit into the equation. Would he be in the rotation? 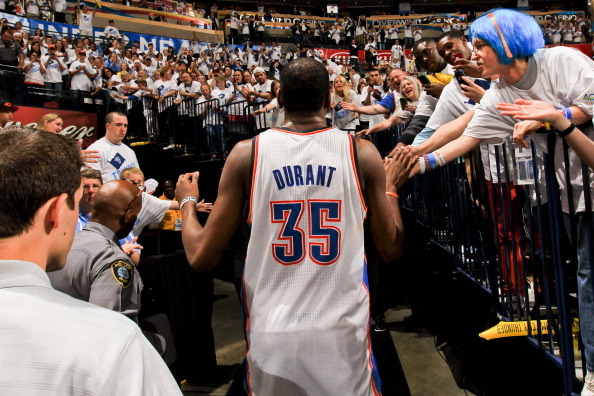 Would he be shuffled back and forth between Tulsa and Oklahoma City? What is known is the Jones was a combination of size, speed, and athleticism that is unparalleled in the league, outside of Kevin Durant and Paul George. A 6’11 hybrid that can possibly play every position not named point guard. It’s a funny thing about fate. You usually see the final product taking shape from a mile away, but when it happens, you’re completely surprised by the end result. All season long the Oklahoma City Thunder have hovered around the top two spots in the Western Conference and the Houston Rockets have hovered around the 6-8 spot. It shouldn’t have come to surprise anyone that these two teams might actually meet in the first round of the playoffs. But when it happened, after the final game of the final day of the season, there was a collective, “Wow, we’re playing James Harden in the first round” train of thought. 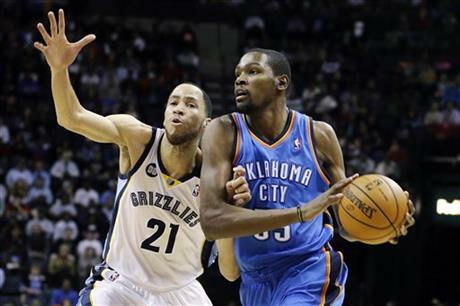 Everyone will want to turn this into James Harden vs. the Oklahoma City Thunder. 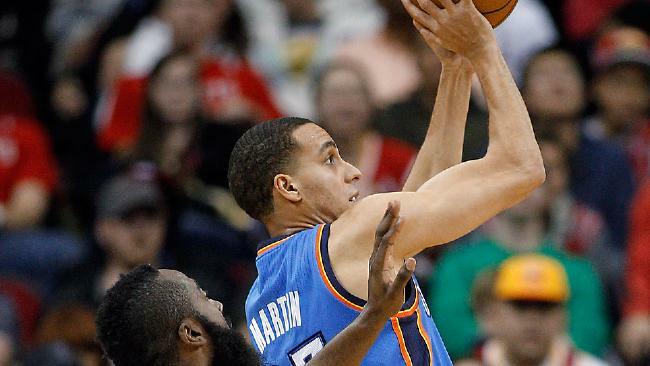 I see that, but we all know, that in reality, this is going to be the Kevin Martin vs. the Houston Rockets series, right? (Crickets, crickets) Well, as fate would have it, these two teams will meet in the first round of the Western Conference playoffs. The top seeded Thunder versus the 8th seeded Rockets. 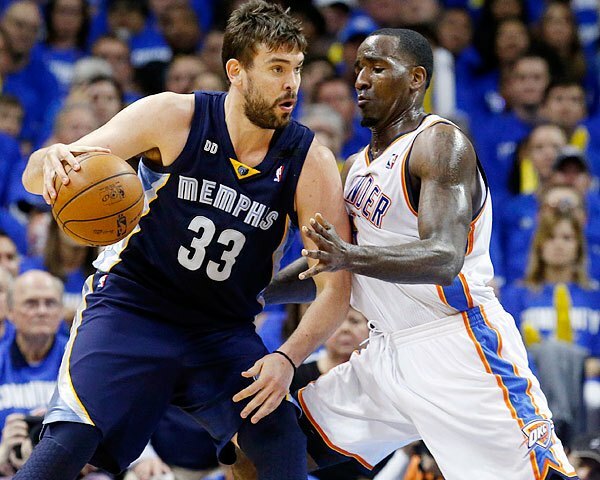 The young, rambunctious upstarts against the grizzled veteran team (how funny is it that the Thunder are a grizzled, veteran, playoff tested team?). It wasn’t long ago that the Thunder were the young upstarts wanting to gain some respect against the defending champion Los Angeles Lakers. 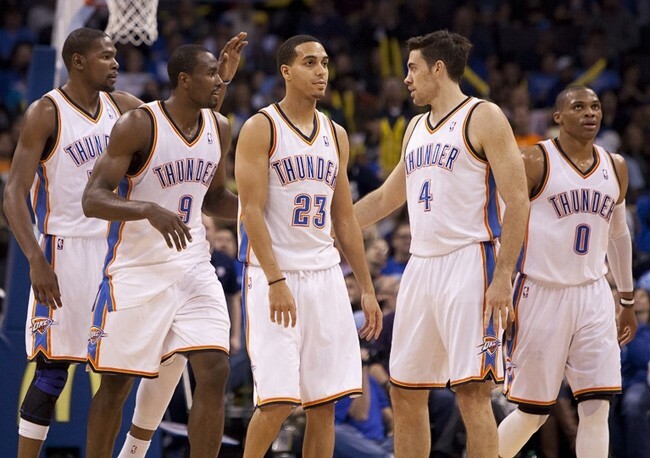 Now, the Thunder are the defending Western Conference champs and everyone will be gunning for their crown. These two teams played 3 games during the regular season. 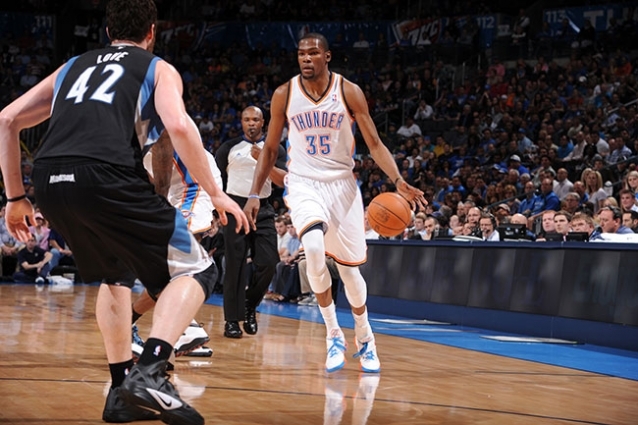 The Thunder took the first two by an average margin of 26 points. In those two games, Harden struggled mightly, while the Thunder basically got anything they wanted on the offensive side of the ball. The third game was a different story. 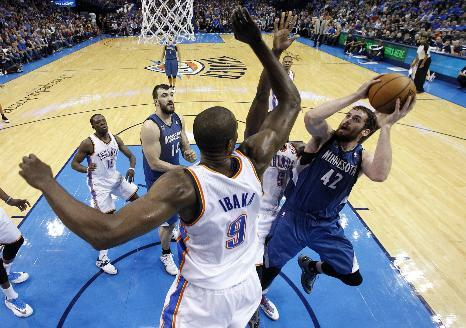 In that game, the Thunder were up by 14 points with less than 7 minutes left to play in the 4th quarter. And then, Harden (and Lin) happened. 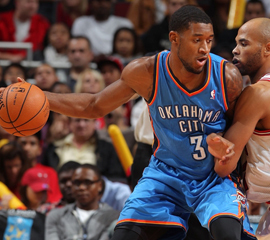 The Rockets proceeded to outscore the Thunder 29-12 from that point to garner a 3 point win. James Harden scored 14 of his career high 46 points in the final 6:30, and Jeremy Lin chipped in with 9 points in those final 6 minutes. But that game highlighted the reason why this will probably be a short series. 1. 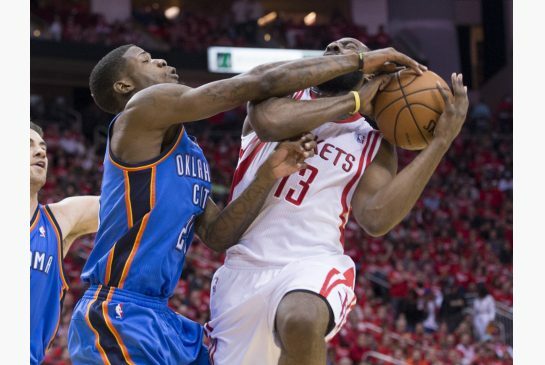 Pick and Roll Defense – This is the Rockets’ bread and butter. Lin and Harden are great at breaking the PnR defense down and either finding the open man or driving and drawing fouls. 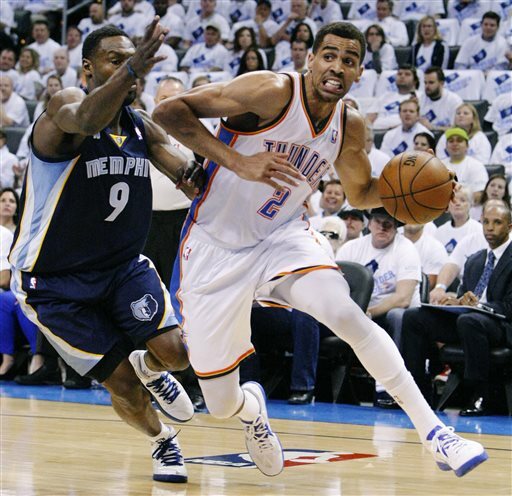 Thabo Sefolosha is great at going under the pick, but can sometimes get caught in the mess of a pick and roll, allowing the ball handler to get to the basket. On the other hand, Westbrook is known to go over screens, which allow the ball handler a sliver of daylight to get a shot off. 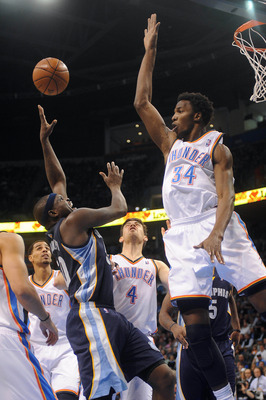 But the key to the PnR defense will be Kevin Durant and Serge Ibaka. Chandler Parsons led the Rockets in 3-point % and will make Durant pay if he tries to help on defense. 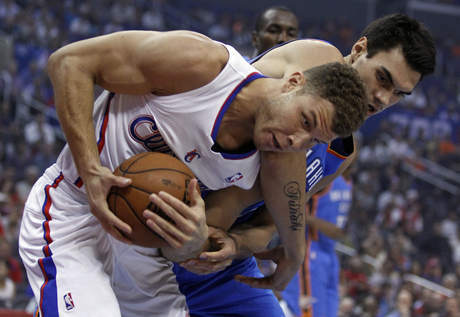 Ibaka is going to have to stay out of foul trouble if the ball handlers get past the initial line of defense. 2. 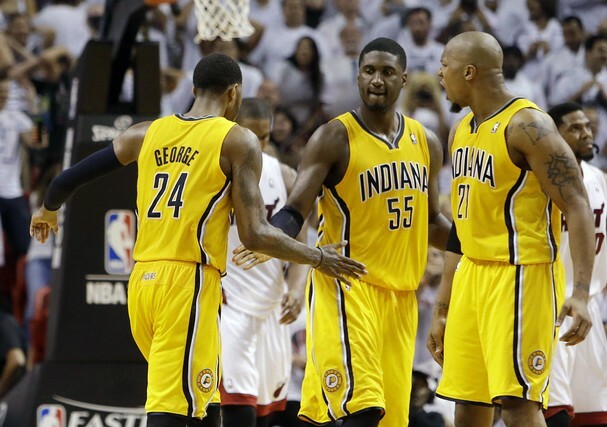 Pace – These are the number 2 and 3 scoring teams in the league. But Houston likes a much faster pace than the Thunder. 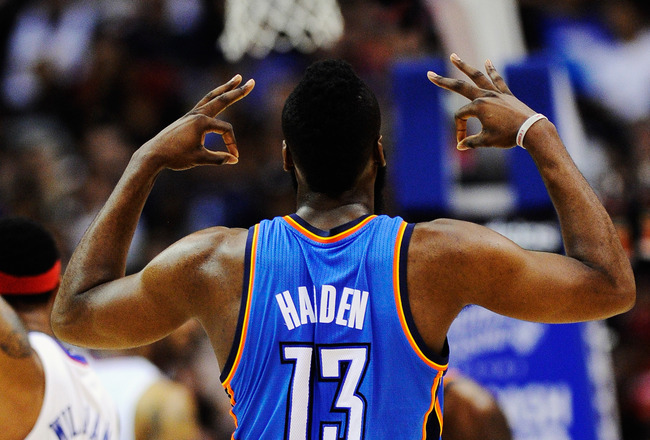 In their two wins against the Rockets, the Thunder kept the Rockets under 100 points. In their lone loss, the Rockets scored 122 points. Houston’s offense is predicated on transition baskets and pick and roll offense. 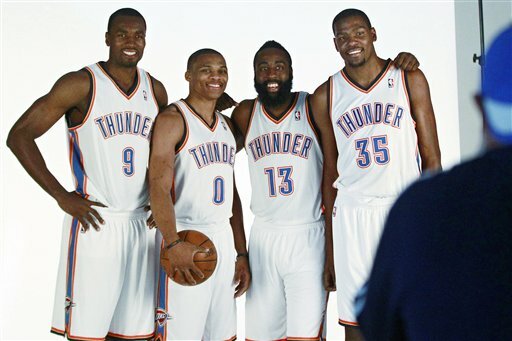 If the Thunder are to win, they are going to have to slow the pace down and make the Rockets a half court team. 3. 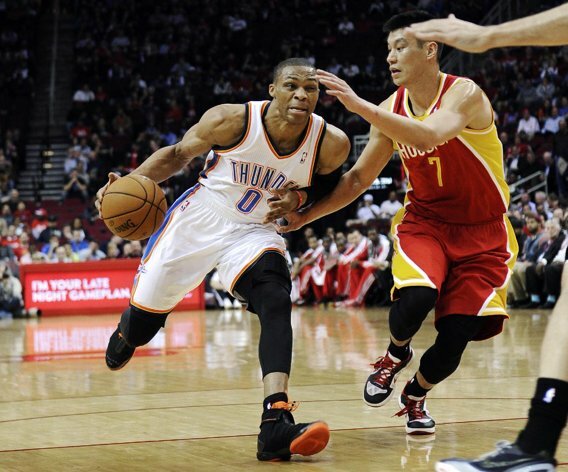 Russell Westbrook – The Rockets have no one on their roster that can come close to guarding Westbrook. 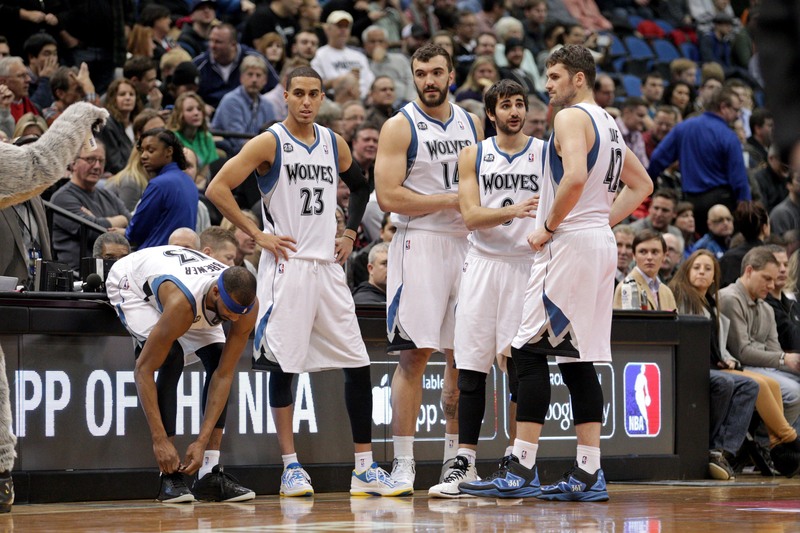 Lin is too weak, Aaron Brooks and Patrick Beverly are too short, and Carlos Delfino is too slow. 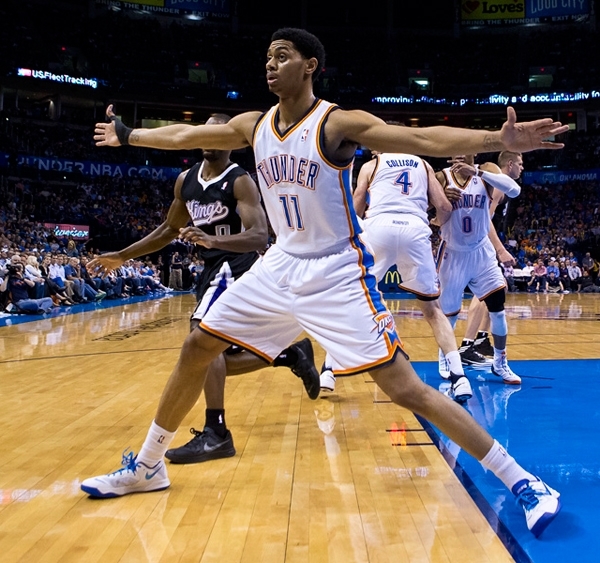 Westbrook should be able to get whatever he wants on the offensive end. 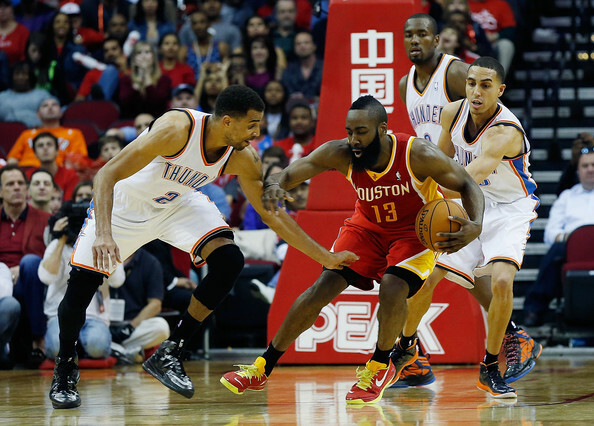 X-Factor: Thabo Sefolosha – His defense on James Harden will go a long way to determining how these games will go. If he gets into foul trouble early, look for Harden to be in attack mode for the entire game. 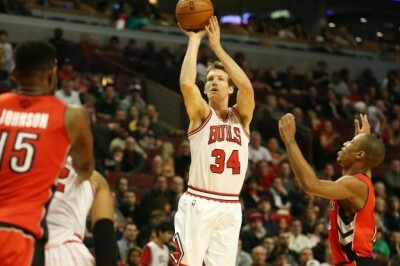 Also, his shooting will be key to keeping the turnovers down. 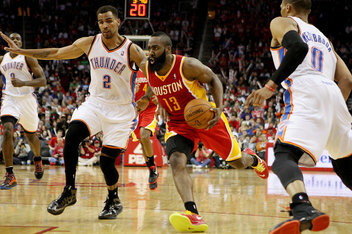 If Harden has to stay on Sefolosha, that will negate him from helping out and jumping into passing lanes to get steals.